Very well done to the 33 runners who took part in this month’s Handicap 5k. Thank you to Mark Beasley and Sharon Crowley for their assistance with the start and finish and also to Elizabeth Crowley, Tim Saban, Callum Beasley’s girlfriend and the starter group for their support to the runners. Winner on the night in a new PB time of 25:50 was Joanne Bowdery, with Tim Robinson first man to finish, in a year best (YB) time of 23:23. Adrian Busolinii was 2nd man in a YB time of 21:27 and the returning Rob King 3rd man in a season best (SB) time of 26:20, narrowly ahead of Karl Shreeve’s 25:52 PB. 2nd lady on the night was Victoria Brett in 26:53, just pipping Abigail Pez on the line as improved her PB by 55 seconds to 26:57. Fastest runner on the evening was Richard Springall with 18:58, ahead of newcomer Johny Penell 2nd quickest with 19:26 and Mark Collins 3rd fastest in a new PB of 19:44. Fastest female was Hannah Neale in 23:04, with Julie Simmons 2nd quickest in 25:04 and Joanne Bowdery’s winning time was 3rd quickest. There were also PB’s for newcomer Joe Malloy, last month’s winner Linda Nolan and new member Michael Andrews; a SB for the returning Adrian Donnelly; YB’s for Peter Smith, Rob Shaw and Theresa Keast, while Ryan Dunning beat last month’s time by 8 seconds. The time interval between 2nd-32nd position was just 3 minutes and 8 seconds, and 79% of finishers were within 1 minute of their adjusted handicap time. 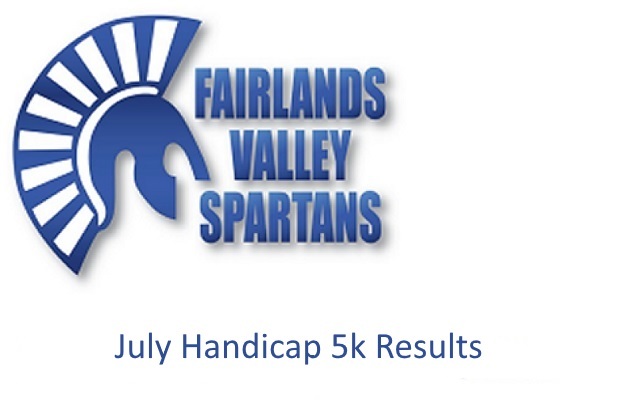 The August Handicap 5k is scheduled for Thursday 3rd August. Full results are attached below.